The Pilot 78G is a great looking budget fountain pen. The pen I will be reviewing has a bold nib that is actually a stub; I do not know why Pilot doesn’t offer this pen with a round tipped bold nib. The nib writes quite well with some feedback but it is a bit dry for my taste; I may have to experiment with some different inks to find what works best with this pen. The Pilot 78G comes with an aerometric-style converter and also accepts Pilot cartridges. It is rare for pens at this price point to come with a converter. For example, the ultra popular Lamy Safari at $35 doesn’t come with a converter; you have to pay an extra $5 to get one. 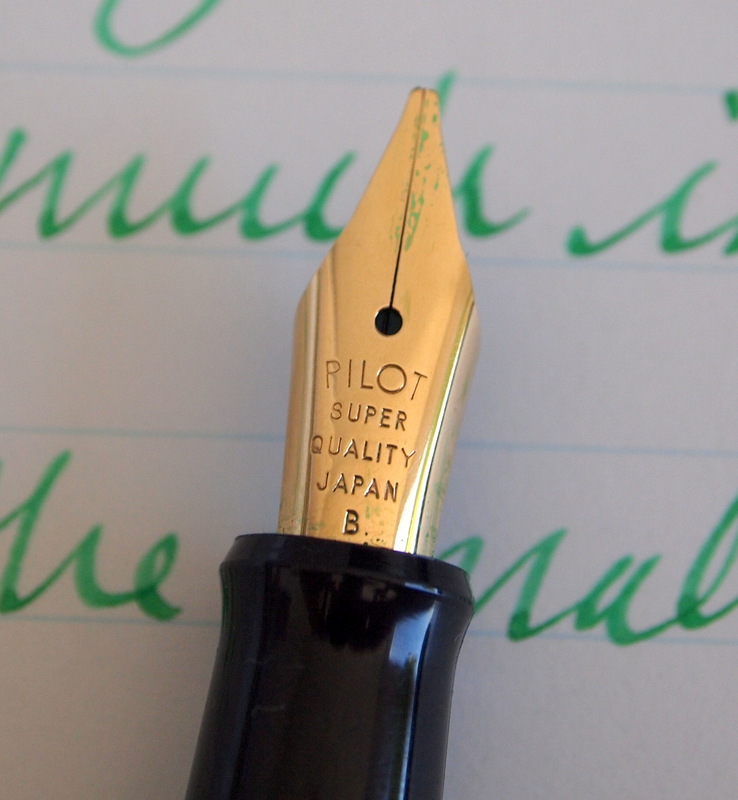 Unlike the aerometric filling system found in a Parker 51 the Pilot’s doesn’t hold a lot of ink. If you plan to do a lot of writing you would be better served by using this pen with a cartridge. 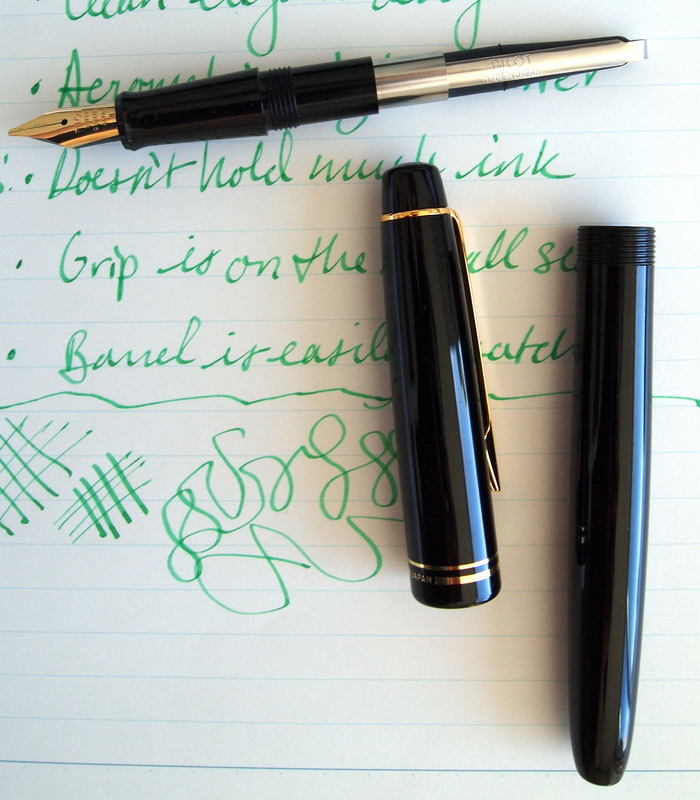 The body is made of a lightweight black plastic and features a gold plated steel nib and clip. The 78G weighs in at about half an ounce which is lighter than I prefer. Capped it measures about 5.25″ and is 0.5″ wide at its widest point. The grip section is a problem, at less than a quarter inch wide I find it too skinny to be comfortable for long writing sessions. If you have larger hands or a tight grip this pen may be a bit too small for you. The body of the 78G seems to scratch quite easily but at this price point it’s not that big of a deal. I have been using the Pilot 78G for 7 days straight now and it is great for taking notes. Compared to my Lamy Safari w/1.1mm stub, the Pilot 78G writes better, looks better and costs a fourth of the price. In short the Pilot 78G is great entry-level fountain pen that I highly recommend. Pilot 78G fountain pen writing sample. 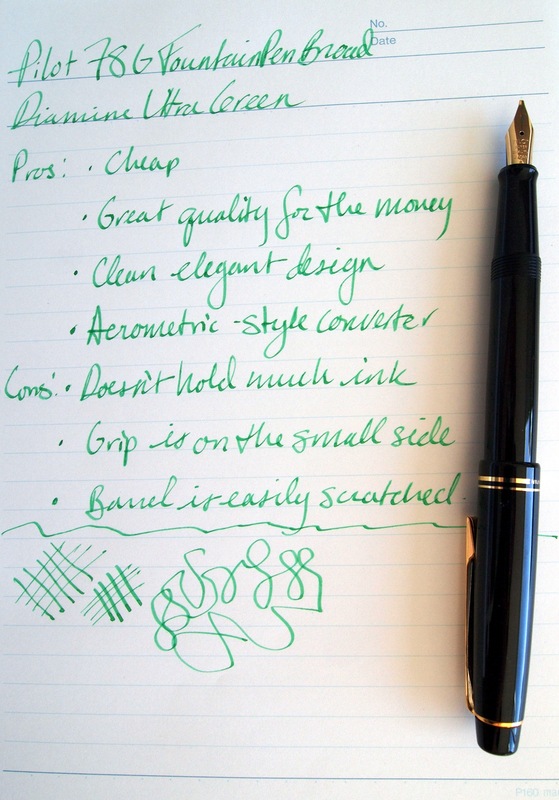 Diamine Ultra Green ink on Maruman P160 Report Pad.